On Monday January 11 2016 at Stansted Airport, UK, plainclothes police officers pulled aside a travelling anarchist (Tim from Bristol) and seemingly sought to coerce him into becoming an informant with a combination of intimidation, veiled threats, and offers of free alcohol. But when he started recording the officers on his mp3 player they quickly terminated the exchange and made a sharp exit. 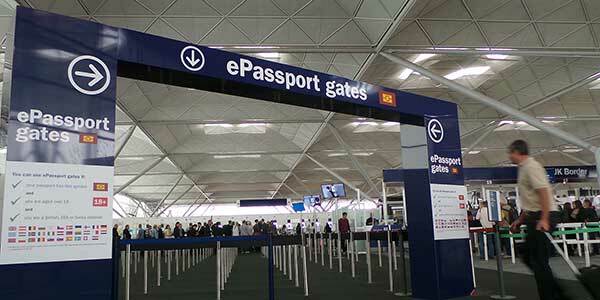 “As I was leaving the EU e-passport gate about 1pm today, I was approached by a man who came out from behind the desk to the left. He was a similar height to me, with short light brown hair/beard, and a light northern English accent. He said “Hi Tim, I’d like to have a word with you. I think you know what this is about”. I got my phone out and called a friend as soon as he started speaking. I told him I had a phone call which I needed to take. A man who had approached in the mean-time from the right, wearing a grey suit-jacket, asked me to turn my phone off. I repeated that I had to take the call. When my friend picked up I asked them to call my solicitor. The man in the grey suit identified himself as a police officer. The man who’d originally approached me asked me to go with him again. I asked “am I being detained?” and he said “it’s nothing like that”. I said that I’m busy and needed to get on. He said “so am I” and that it wouldn’t take long. He kept saying that he wants to talk somewhere else because it would be “in your interest” and I wouldn’t want to talk about it in public. I just repeated that I wanted to stay where we were. I asked him what it was about to find out if I could leave, and he said that I’m “heading down a dark path” and repeated that we should talk in private and “I can buy you a drink”. At this point I’d had enough so I told him “if I don’t have to talk to you then I’m leaving” and started walking. He said “we’ll come with you”. I said “I’d rather not” but he walked by me anyway. This isn’t the first time that British counter-terror police have fled when faced with being recorded either – see https://corporatewatch.org/videos/2014/activist-harrassed-counter-terrorism-command. This just goes to show that if you’re approached by the police to be an informant, standing up to them is the best response. They don’t like it when we record THEM and ask questions, or when we stick together instead of letting them intimidate us one by one. Police feed on our isolation, so it’s when we stand up to them publicly instead of keeping our heads down that they back off and leave us alone.